I have a time domain signal based on LTE standards. Carrier spacing = 15KHz, Symbols per slot = 6, extended Cyclic Prefix = 512 samples FFT size = 2048, No. of sub carriers = 1200, channel BW = 20MHz, Samp Freq = 2048*15KHz = 30.72 MHz, Total Bits = 14400 (Symbols * slots * bits used to MOD * total subcarriers). It is QPSK modulated (using qammod ("IntegerSymbols",2^bits,binary) in matlab); This QAM modulated data is IFFT'ed after zero padding on the sides and DC carrier insertion is done and then CP is added (512 samples to a 2048 sample bin). This signal now is windowed (Point wise multiplied by a window function(only in the TRANSMITTER side) (FOR DIFFERENT REASONS) in time domain) "BY A HAMMING WINDOW FUNTION" Keeping all the overlap add constraint in mind. On the receiver side, no noise is added, no specific channel is modeled. Simple reception. On the receiver side, CP is removed and then the stream is FFT'ed and only the central info carrying subcarriers are taken. This stream at this point is still modulated. However when I try to plot a "scatter plot figure" of the QAM modulated data from the txer side and the FFT'ed data in the receiver, I get a pattern as shown in the figure above which seems to be some sort of quantized thing. I am not sure what it is or what is it caused by. Could you please help me on it? On decoding Error/BER is 0 but EVM is -18dB. P.S: I've asked this ques before but I reckon the details weren't clear. So fingers crossed this time. Since this is in simulation: Test. Send a stream of constant symbols, from only one subcarrier. That way, you can see where the effect comes from. Iterate. Debug. You're the engineer sitting in front of that problem – go and investigate! Not the answer you're looking for? Browse other questions tagged fft ofdm window-functions ifft lte or ask your own question. 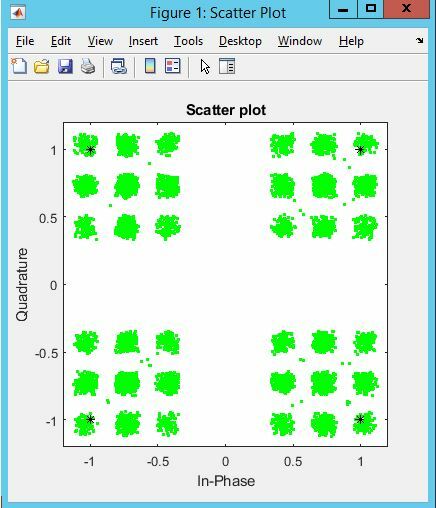 I have the scatter plots for a Hamm and Tukey(0.25) windowed data. The complex data plotted from Hamm windowed forms a pattern, why?